In large skillet over medium heat, brown sausage; drain. Stir in 3 tablespoons of the pizza sauce. (Reserve remaining pizza sauce). Heat oven to 375° F. Separate dough into 10 biscuits; divide each in half horizontally, forming 20 rounds. Press or roll each round into 4-inch circle. Place 1 tablespoon meat mixture in center of each circle. Top each with cheese; press lightly. Fold dough over filling to form half circle, stretching to fit. Press edges together; seal and prick top with fork. Place on ungreased cookie sheets; brush with beaten egg. Bake at 375°F. for 9 to 14 minutes or until golden brown. Meanwhile, heat remaining pizza sauce in small saucepan over low heat until hot. 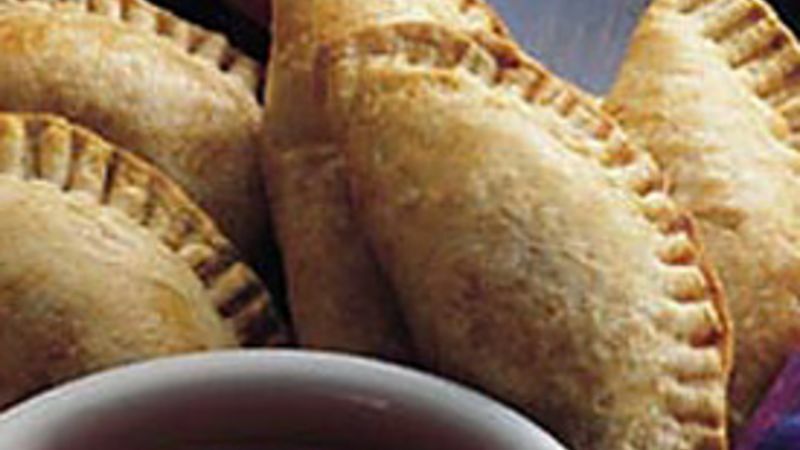 Serve warm empanadas with pizza sauce for dipping.